Backup your important photos, music, video, and contact list. Keep your photos and videos on your social network at any time. Copy the SD / TF movie to your iPhone / iPad / Andorid mobile phone and watch, easily edit. Portable business (easy to work with documents). Free App from App store for communication between your Devices. iPhone 8,8x, iPhone 7/iPhone 6s/iPhone 6/iPhone 5s/iPhone 5/iPhone SE Samsung Galaxy S8 /LG smart phone and all the android phones with OTG function.iPad Pro/iPad/iPad mini 4. Macbook Air/Pro/iMac/iMac Pro SRL camera/Trail Camera/Action Camera/Gopro Camera/Quadcopters Camera. When you first insert our SD card reader, it will pop up under the tips. As long as you follow the steps, go to your "application store" download application "iusb drive" installation. If your iPhone can't read the card, remember to download the APP "iusb drive". For Android phones or devices:If your phone can not work,you need to set the application in your phone setting,find the other setting,open the OTG connection,then it can work. 1. Please do not disconnect card reader during file transfer. 2. Please do not connect both side of card reader at the same time. 3 .Please do not use card reader as cable. * If iOS device pops up a message said "this accessory is not optimized for this phone", just disconnect and reconnect again. 4 in 1 Card Reader which is suitable for all your devices,,Lightning connector for iOS devices-iphone & ipad, Micro USB connector for Android Phone devices,TYPE-C connector for USB C devices like as Samsung Galaxy S8 S8+ New Macbook Pixel XL Nexus 5X 6P LG G5 G6 V20 Pixel 2 XL and other usb-c device. SD & TF card reader have faster speed and huge capacity, USB 3.0 enables data transfer rates of up to 5Gbps for faster sync times, reading and writing are fast, quickly release memory on your cell phone,Support 8G-2T SD and TF card (Memory Cards are NOT Included).also support SDXC, SDHC, SD, Micro SDXC, Micro SD, Micro SDHC (SLR camera/ Trail Camera/ Go pro Camera). Download the free APP-iUSB Drive which manage your data on the APP for ipone ipad very easily, easy to operation,you can use micro sd card reader to backup and restore your contact list, document viewer for all major file formats, voice recorder and text editor etc. Good products for travel and business trip - memory card reader,easy to carry,viewing, editing, sharing pictures and videos in the camera by smart phone and transfer to you laptop whenever wherever. we provide 1 year warranty for all of our products,any question please feel free contact with our customer service team. Ensure 100% compatible and syncs with lightning devices, can be used as iPhone X iPhone 8 7 6 6s Plus 6 Plus 5s 5c 5, iPad Air Air 2,Android, type c.
View More In Memory Card Readers. 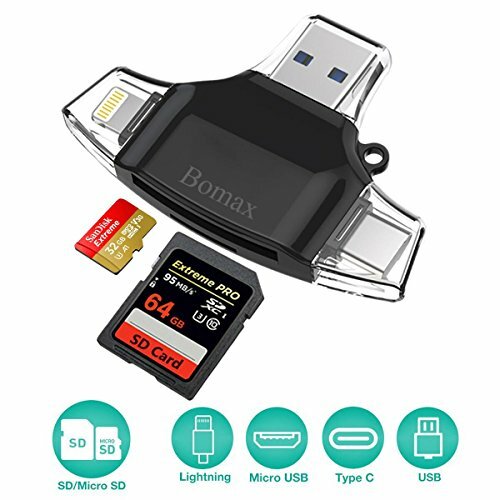 If you have any questions about this product by BOMAX, contact us by completing and submitting the form below. If you are looking for a specif part number, please include it with your message.